WASHINGTON • US President Donald Trump has cast doubt over the timing of his threatened strike on Syria in response to a reported poison gas attack, while France said it had proof of Syria's guilt but needed to gather more information. Fears of confrontation between Russia and the West have been running high since Mr Trump said on Wednesday that missiles "will be coming" after the suspected chemical weapons attack in the Syrian town of Douma on April 7, and lambasted Moscow for standing by Syrian President Bashar al-Assad. "Never said when an attack on Syria would take place. Could be very soon or not so soon at all!" Mr Trump said in his latest early morning tweet yesterday. Russia's Foreign Ministry said yesterday that Moscow does not want an escalation of the situation in Syria, but said that it could not support "dishonest accusations" and that it had found no evidence of a chemical weapons attack in Douma, just east of the capital Damascus. Ms Maria Zakharova, spokesman for the Foreign Ministry, called statements from Washington "militaristic", and said the world should think seriously about the possible consequences of threats. She said threats by the United States and France were a violation of the United Nations Charter, and that an Israeli air strike on Saturday had worsened stability in Syria. President Emmanuel Macron said France has proof that the Syrian government carried out the attack, which aid groups have said killed dozens of people, and will decide whether to strike back when all the necessary information has been gathered. "We have proof that last week... chemical weapons were used, at least with chlorine, and that they were used by the regime of Bashar al-Assad," Mr Macron said, without offering details of any evidence. Prime Minister Theresa May prepared to convene a special Cabinet meeting yesterday to weigh whether Britain should join the US and France in a possible military action. Mrs May recalled ministers from their Easter holiday to debate action, and London's Daily Telegraph reported on Wednesday that she has ordered British submarines to move within missile range of Syria in readiness for strikes against the Syrian military. There were signs, though, of a global effort to head off a direct confrontation between Russia and the West. The Kremlin said a crisis communications link with the US, created to avoid an accidental clash over Syria, was in use. Chancellor Angela Merkel said Germany will not join any military strikes against Syria, but supports Western efforts to show the use of chemical weapons is unacceptable. Syria's military has repositioned some air assets to avoid missile strikes, US officials told Reuters. Locating them alongside Russian military hardware might make Washington reluctant to hit them. Russia, Mr Assad's most important ally in his seven-year-old war with rebels, said it had deployed military police in Douma yesterday after the town was taken over by government forces. The Russian military said it had observed movements of US Navy forces in the Gulf. 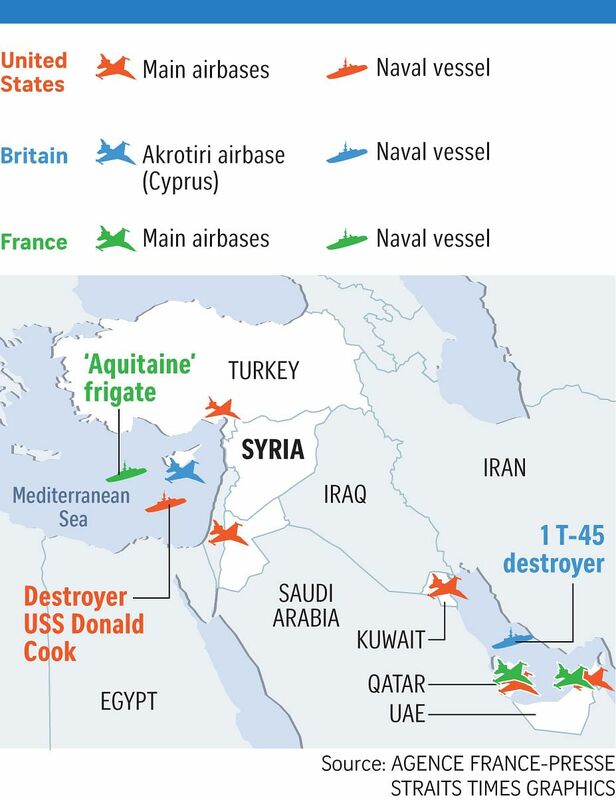 Any US strike would probably involve the navy, given the risk to aircraft from Russian and Syrian air defences.